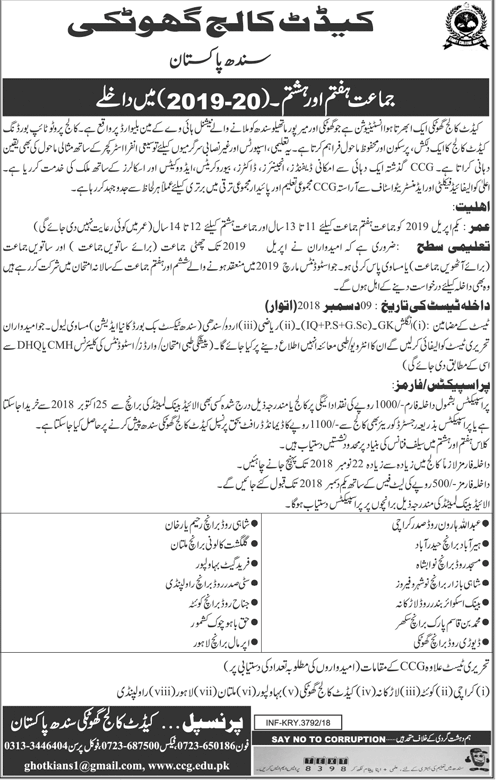 Cadet College Ghotki Admission 2019 are open now for 7th class to 12th class in which all the students can apply those who are eligible to submit their admission forms. Here at webstudy.pk you can get complete details about Cadet College Ghotki 2019 Admission. if you want to get info about Cadet College Ghotki entry test 2019, admission form, admission fee etc then you should read all this artical. After reading this artical if you think that you are eligible to submit your Cadet College Ghotki Admission 2019 Form then you can get your prospectus from principal office Cadet College Ghotki or you have to order it through Pakistan Post with demand draft. Cadet College Ghotki Prospectus charges or fee is individual for each class. 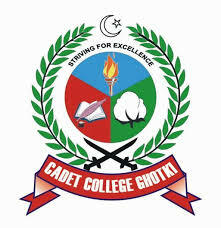 Ghotki Cadet College invites application forms from only hardworking, self motivated and energatic students because in cadet college students have to do hard training because in future they will be army officers. Parents wants their children to join cadet colleges so that they become army officers in upcoming time. In this post we have posted all the details about Cadet College Ghotki Admission 2019, Eligiblity criteria, documents required to attach with form, entry test dates and result, fee structure, rules and regulations of the college and all the information that you need. All the students who have passed the 6th class from any school of English Or Urdu medium are eligible to submit their application form through post or by hand. Candidates have to pass CCG Entry test to get admission in Cadet College Ghotki. Entry test will be from following subjects. Students who have just given the examinations of the 6th class and waiting for the result are also eligible to submit their application forms. Applications that will be submitted after due date will not be entertained. If you think that you are eligible according to the given criteria then you have to walk through the Cadet College Ghotki principal office to get your prospectus that contains all the information about college life, rules and regulations along with admission form. You have to fillout the admission form and submit to the admission office and then wait for the entry test. Fill the admission form carefully because wrong information provider will be banned for admission and form will be rejected. All this was the details of the CCG Admission 2019 Last date, Entry test, eligibility criteria, result, fee strucuture. if you have any question regarding Cadet College Ghotki 2019 Admission then you can comment us below. webstudy.pk is right place for students to find right information about all the universities and institutes admission, merit list, date sheet and results of each class. Moreover you can download Guess Papers, model papers & past papers of each class.